This unusual structure was specifically designed to test submarine antennas in an environment that replicated conditions at sea. The roof contained a 93-by-66 foot concrete pool filled with seawater. The pool was six inches deep except for a well in the center that was about eighteen feet deep. Researchers conducted tests and collected data in a control room under the pool. The three tall overhead arches were made of wood to minimize radio-frequency reflections, which could cause errors in measurement. Tests conducted here determined how well a submarine radio system would perform when communicating with satellites or the shore. During a test, an antenna was installed in the well of the pool. This simulated the conditions of a submarine at sea. A transmitting antenna mounted on a carriage moved up the middle arch, simulating different locations, from the horizon to directly overhead. Researchers could measure radio frequency signals generated between the two antennas to determine how well the submarine antenna functioned. 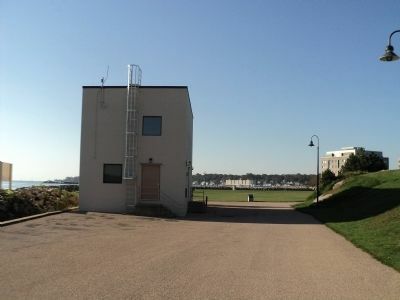 reused in Newport, Rhode Island, for a new antenna over-water test facility at the Naval Undersea Warfare Center. Location. 41° 20.574′ N, 72° 5.561′ W. Marker is in New London, Connecticut, in New London County. Marker can be reached from East Street, on the left when traveling south. Touch for map. 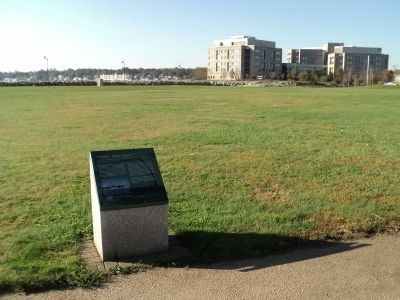 Marker is at Fort Trumbull State Park. Marker is in this post office area: New London CT 06320, United States of America. Touch for directions. Other nearby markers. At least 8 other markers are within walking distance of this marker. Magnetic Silencing (within shouting distance of this marker); Periscope Test Facility (within shouting distance of this marker); Civil War (about 300 feet away, measured in a direct line); The Third System (about 300 feet away); Coast Guard (about 300 feet away); Post Civil War to 1910 (about 300 feet away); War of 1812 (about 300 feet away); American Revolution (about 300 feet away). Touch for a list and map of all markers in New London. 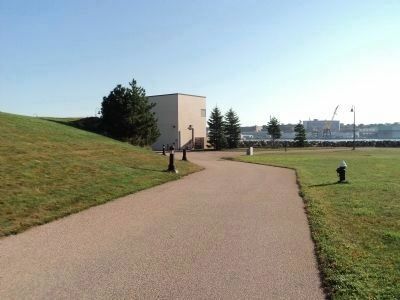 The marker is seen here on the right side of the walkway near the waterfront in Fort Trumbull State Park. More. 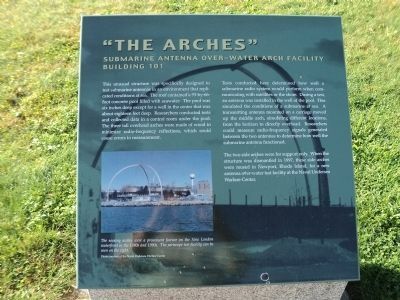 Search the internet for “The Arches”. Credits. This page was last revised on June 16, 2016. This page originally submitted on October 16, 2011, by Bill Coughlin of North Arlington, New Jersey. This page has been viewed 379 times since then and 5 times this year. Photos: 1, 2, 3, 4. submitted on October 16, 2011, by Bill Coughlin of North Arlington, New Jersey.